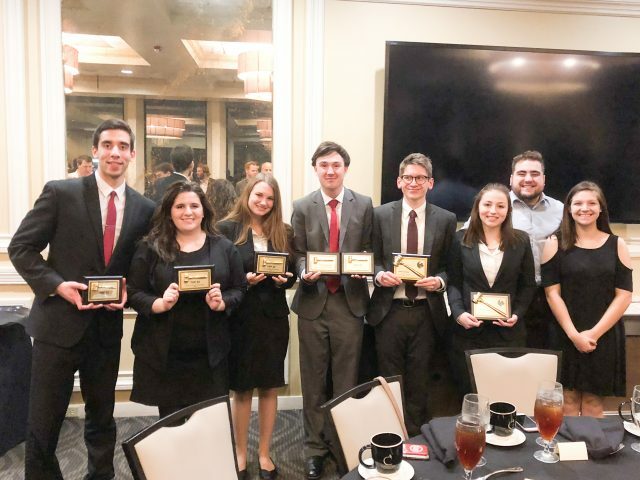 The Moot Court team at Youngstown State University made their 10th appearance at the American Moot Court Association’s national championship tournament on Jan. 12 and 13 at the University of Central Florida. Four different teams were entered into the competition, and they each had either team or individual successes. Throughout the regional tournaments, 457 teams entered and only 80 teams were selected to attend nationals. Ron Slipski, lecturer in the department of politics and international relations, has been coaching YSU’s Moot Court team for the last eight years and has attended nationals every year. He said he enjoys watching the students succeed in the regional and national competitions. According to Slipski, the team endures months of preparation for the national competition and works with local attorneys. The team entered in three regional competitions this year, which determined the individual teams who attended nationals. Slipski said their success at nationals was very close to top-notch institutions at the competition and scoring was tense. “There were 160 individuals that went to nationals and we scored fifth and 25th in the nation,” he said. In Slipski’s opinion, watching the students grow and make professional connections is an important aspect of moot court. Jacob Tomory, a junior philosophy and political science major, has attended nationals two times, and he and his partner, Samantha Fritz, lasted to the round of 16 teams and were eliminated on a 2-1 decision, losing to the University of Chicago. Of the four teams entered, three made it to the second day, which is a huge improvement from last year, according to Brian Duricy, a senior mathematics and economics major, who has been a member of moot court since his freshman year. In last year’s competition, all three teams that made it to the second day in last year’s competition got knocked out in the round of 64. This year, all three teams that went on to the second day made it to the round of 32. One of the teams in the round of 32 lost to the eventual national champions. Tomory said he hopes YSU will stay in the upper division of the rankings in the future. “Looking at our overall performance, along with the performances of the teams ahead of us in the rankings, I expect [the teams] to maintain our national ranking of sixth, or maybe even move into the top five programs in the country,” he said. Tomory said moot court is a rewarding program and challenges you in all aspects of life. Brian Duricy, within the last two years, Duricy ranked 139th and 113th in the nation, where this year he placed fifth individually. Moataz Abdelrasoul, a junior pre-law major and second-year moot court team member, placed 25th individually in his first time competing in the national championship tournament. According to Duricy, the YSU teams are always coming up with new arguments and viewpoints to have an edge over other institutions. Duricy said watching the team’s hard work reflect at nationals is always rewarding. Michael Factor and Allyson Cooper, who qualified by placing fourth overall in the Rubber City Regional, which included 24 teams of competitors. Moataz Abdelrasoul and Caroline Smith, who qualified by placing second at the Midwest Regional, which included 30 teams. Brian Duricy and Mellicent Costarella, who reached the final four at the Midwest Regional. Samantha Fritz and Jacob Tomory, who placed second in the Great Lakes Regional, which included 46 teams.